Instagram Message: One of these pumpkins will wear a donut pool floatie and the other #33 of the Vikings. Check Thoughtfulpinch.com for Halloween pinches. It doesn't bother me if I have to put my wine glass down in order to pass out candy because I love hearing kids say, “Trick or Treat” on Halloween. I’m not sure all parents take the time to explain that the phrase is really not a statement but a question. It's like a condensed version of saying: "Would you like a trick? Give us a treat and we'll make sure not to egg your house tonite." I watched a short, but very informative, video on history.com and loved learning about the origins of many traditions associated with Halloween. I’m thinking about starting the new phrase - Trick or Pinch. It doesn’t roll out as easy but someday Pinch will be synonymous with treat if it’s the last thing I do! J/K. Picture me as an evil villain cackling and pumping my fist in the air saying that. Who's on the Pinch list this year? MY KIDS. One is dressing up as a donut and the other will be a football player. Any guesses of who will be who? My friend had recently learned that her daughter’s Love Language was gifts so she bought her a couple of pinches from Lush. With a twist in the concept, I copied my friend by going to the Lush store and tied in "touch", which is my daughter's Love Language. I found some amazing products that I turned into Halloween-themed pinches. Goth Fairy Glitter Massage Bar - which is a bar of lotion that contains glitter and it’s shaped like a goth fairy and Lord of Misrule Shower Cream. Just the name itself will have my son taking more showers and using this bottle up in no time. I hope to put Goth Fairy lotion on my daughter when I give her a shoulder rub or a leg rub. My son is a total "gifts" Love Language guy. The green color of the Lord of Misrule shower gel is gross enough for any kid to get excited about. The spinners are fun too. In order to use, get into the bathtub and hold the wooden pegs in the center of the spinner under the faucet. The water will spin the spinner and it will fill the tub about five times with bubbles until its all used up. Finished gifts ready to give the kids on Halloween. TEACHERS. While I was shopping on OrientalTradingCompany.com because the kids wanted to give their classmates jack-o-lantern stress balls, I checked out what else they sold because I was considering what to give the teachers for Halloween. I found personalized candy corn packets and Halloween themed fortune cookies. Perfect. I had my witches cups from two years ago that I was dying to use for thoughtful pinches. However, when the items arrived, I felt like the pinch wasn't quite substantial enough to give. I needed something small to add to the cups. When I was at Walmart I spotted Halloween patterned gloves - pairs of black, orange, eye balls and bats. I was going to get some because I saw that they were only $1.50. Well, what a surprise to find that it was $1.50 for two pairs of gloves! Score! Of course, I bought everything they had on the shelf. The gloves wouldn’t fit into the witches cups so we put them in gift bags (look familiar from last year?). We can’t expect cashmere for $1.50 - these are more like the kind you keep in your car or purse for those times you forget or you want to pump gas. I attached a little note that says,” You can never have too many pairs of gloves. Please donate these if you have plenty.” This gives an “out” to those who wouldn't wear them but would feel good about donating them to organizations that help to keep people warm during the Winter months. OTHERS. The administrative assistant at our lower school does a lot for me so I always try to pinch her as much as I can. I also wanted to pinch the school director and assistant director. We can't forget our mail carrier, my housekeeper, one of my tennis coaches and my daughter's ballet instructors. We are giving the witches cups filled with some of the original treats that I bought for the teachers. The little "extra" that I added to the cup is a cool syringe pen. Since I hadn't been to an adult Halloween party in a long time, I needed a hostess gift because I was invited to one this year. When I found out how much work the hostess put into the theme and decor I thought a “Little Pumpkin” from Lush would be super thoughtful. I wrote on the card, “After all the work you put into the party you deserve a nice, long bath.” I thought about pinching my son's hockey coaches but that list goes deep so I’ll take care of those guys at Xmas. My daughter's ballet carpool buddies are all getting a treat bag too. Putty, candy corn and fortune cookies. 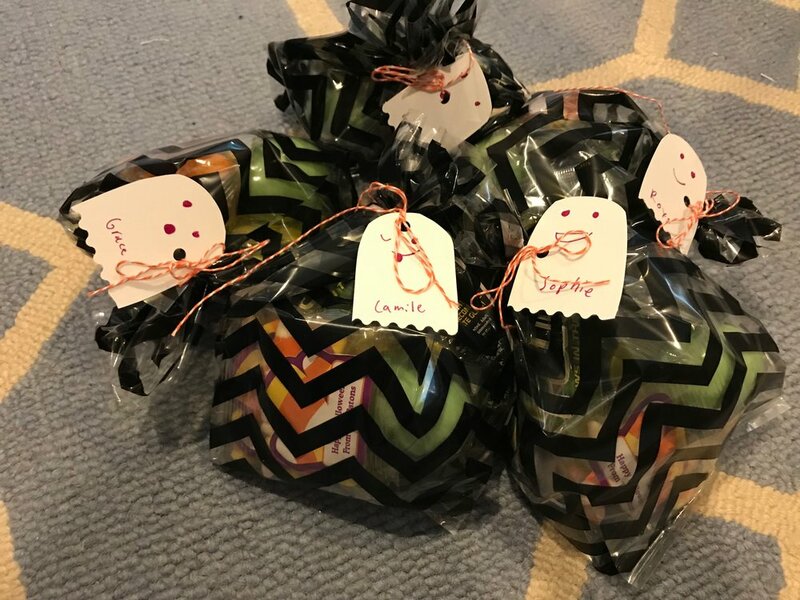 The completed gift bags for the ballet dancers with ghost name tags. Jack-o-lantern stress balls the classmates. FAMILY AND FRIENDS AFAR. The kids really took their time to sign the cards we sent out this year. I was a proud mama addressing the envelopes and sending them out. Btw, the cards were 1/2 off from last year’s after Halloween sale. Not only did it save me money, but I had the cards early and I was able to have the kids sign them whenever we had some down time. As opposed to the usual gun-to-the-head-sign-these-cards-or-else situation I put them in every holiday. Win-win. I also sent some socks, some tattoos, some hand towels. Again, the key to being able to send these pinches is that they were purchased from the sale after Halloween - I've had these items for almost a year. Now the only pinch I need to find is for the hub. I’m heading back to Lush. Happy Halloween!